To what extent would you obey orders if these came into conflict with your ethical or moral convictions? We may think we are free to choose. However, the truth is that it is hard for human beings to disobey because since we are children we have accustomed ourselves to submission. In every society there is some sort of hierarchy in which some individuals exercise a degree of authority over the others. Parents have authority over their children, the teacher over his students, and so forth. Many experts have focused their attention on this topic and there is a wide range of answers to the question: why do people obey even if orders going against their principles? In this post we will be outlining the psychological answer to that question and we are going to connect this issue with real news stories in order to see the dimension of this fact. Obedience to the authority may help us understanding some events, of different nature, that have occurred recently or some years ago. October 22 2014: the Catalan Radio program “El matí de Catalunya radio”, in a section about police actions and law (minute 24 to 28), reported a brawl between two young men that took place few years ago in a Calella hotel, causing damage to the furniture. According to the hotel security guard, one of the two men brawling was wearing a red t-shirt and the other a strapless one. After the incident, the police detained two boys, who were quarrelling on the street, because allegedly they fitted the description. They were foreigners and the police decided to make them clean all what they had broken in the hotel as punishment. When the security guard saw the boys cleaning he got really angry with the police officers and asked them why two clients of the hotel were brushing the floor. It was all a misunderstanding and the two boys had nothing to do with the brawl. They just obeyed the police orders because they were worried about the consequences if disobeying. This a funny example of how obedience could make us accept a punishment, even if we know that this isn’t fair. However, there are some more serious illustrations. February 6th 2014, Tarajal Beach (Ceuta, Spain). Two hundred African migrants attempted to reach the Spanish enclave of Ceuta through the Biutz border crossing in the first hours of daylight. Some of them decided to swim and wade towards the Tarajal beach where police officers were waiting. The Spanish Civil Guard, following orders, fired rubber bullets at migrants in order to persuade them not to reach the coast. At least 15 people are thought to have drowned and the death toll officially reached 12 people. Why did police officers fire the bullets without thinking about the consequences? Why any of the civil guards queried the order, despite knowing that migrants were exhausted and could have been frightened by the shooting? The video shows civil guards firing rubber bullets and using anti-riot weapons against the immigrants swimming towards the Tarajal Beach. El País TV. Holocaust (1945): After the Second World War many people collaborating with the Nazis claimed to have committed atrocities just because they were following orders. Hence, they assigned responsibility for their actions to someone higher in command. 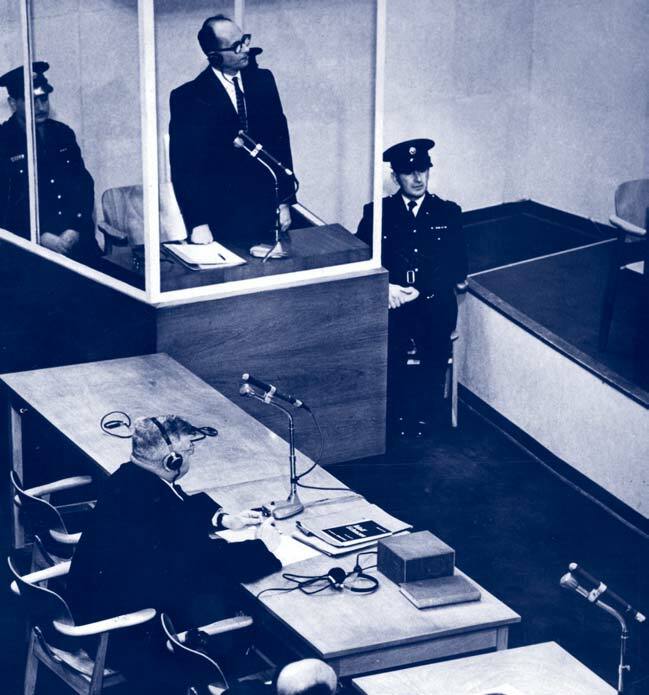 One of the most well-known cases is that involving the officer Adolph Eichmann, who asserted that decisions had been made not by him, but by Müller, Himmler, etc. During his trial in Israel, Eichmann showed proudness for his strict adherence to duty in transporting Jews and for his efficiency in the job. He seemed to be an ordinary bureaucrat, not a psychopath. The defendant asserted that he had been “following orders” and therefore he could not be guilty of war crimes. Was this assertion just an excuse? Adolf Eichmann standing in his bullet-proof box in the court room in Jerusalem, 11 December 1961. Although the pea of following orders cannot be consider a justification for killing innocent people, could it be an explanation for all the examples given above? In 1961, the psychologist Stanley Milgram conducted an experiment to look at how normal people can commit atrocious acts, simply because they are following orders. He recruited 40 male participants advertising for volunteers to take part in an experiment to examine the effects of punishment on learning. The volunteers were the teachers and some accomplices of Milgram, believed to be other participants, played the role of learners. The teacher’s task was to test leaner’s ability to learn word pairs. Every time the learner made an error the teacher had to administrate an electric shock, increasing the voltaje each time. The electric generator had 30 switches, each labelled with a voltage ranging from 15 up to 450 volts. The teacher was sitting in a room with the experimenter, while the learner was strapped into a chair with an electrode attached to his arm in a room next door. Even though the teacher could not see the learner, he could listen his protests and cries. Setup of a Milgram experiment. The experimenter (E) convinces the subject (“Teacher” T) to give what are believed to be painful electric shocks to another subject, who is actually an actor (“Learner” L). Despite the reality of the set-up it was all a fake and the learner’s responses were pre-recorded. If the teacher felt uncomfortable at some point and asked the experimenter whether he had to continue with the test, the experimenter told him something like “the experiment depends on your continuing compliance”, “you had no choice”, etc. Although most of the volunteers obeyed the experimenter, the truth is that many of them struggled throughout the test and showed tension symptoms, such as stress, trembling, nervous laughing, groaning and uncontrollable seizures. Content written by psychologist Mercedes Santos. Table designed by Marina Force-Castells. The results showed that the 63% of the participants (25 out of 40) continued with the experiment to the full 450 volts. 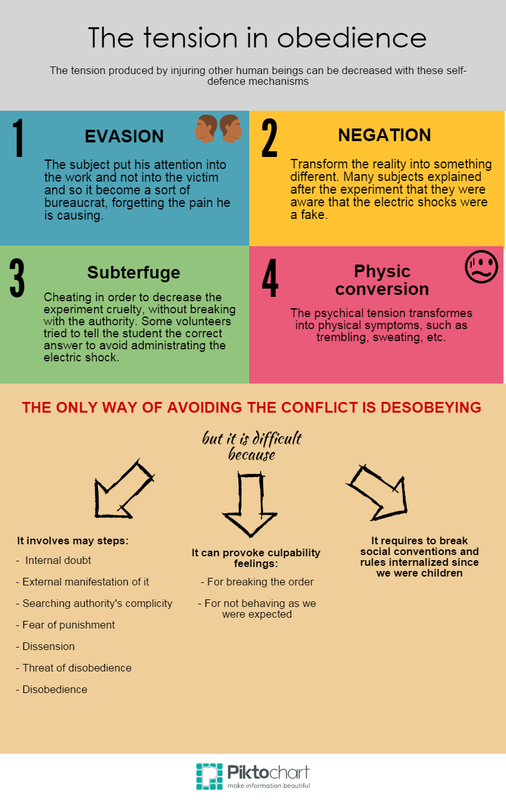 After several follow-up experiments with little variations introduced, Milgram conclude that “normal people, who just do their job and present no hostility at all, can become terrible agents of destructive processes”. Percentage of people who obeyed the experimenter and when did they stop administrating the electric shocks. “Psychology” by David Myers (pages 702 to 709). This entry was posted in Sin categoría and tagged Ceuta, Holocaust, obedience to the authority, Stanley Milgram, submission by Marina Force-Castells. Bookmark the permalink.